When you purchase a Clinger Holster, you can rest easy. You have 2 FULL WEEKS to return it for a refund minus shipping costs if you’re not happy with your purchase. 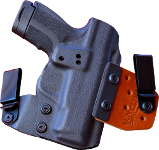 We’re a premium holster brand. We want to give you a premium experience. Large Orders (over $200) will have a 30% restock fee.